If you look in the mirror and wish you had a more attractive smile, porcelain veneers may provide the answer you are looking for to update your image. 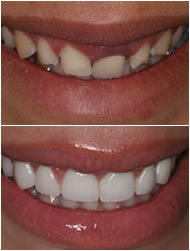 Made from fine dental porcelain, veneers can cover imperfections and transform your appearance. With veneers, you can cover stains, close gaps, and produce uniformity. Depending on your case, you may choose from custom veneers or minimal preparation options. Before beginning any treatment, schedule a consultation with a skilled cosmetic dentist. At this visit, explain your desires in detail to your doctor. Some people even bring examples of smiles that they like. Your dentist will combine this information with a complete examination to develop a customized plan for your new smile. Handcrafted to fit your specific smile, traditional porcelain veneers can be created to complement your facial features, neighboring teeth, and personality. For traditional veneers, your doctor will prepare the teeth by removing a thin layer of enamel and then take impressions of your teeth. Your dentist will send this information to a trained ceramist, who will generate your restorations. While you wait, some dentist will place temporary veneers, giving you a chance to try out your new look. Once the permanent veneers arrive from the lab, you will return for final placement. Marketed through brands like Durathin or Lumineers, minimal-prep veneers are ultra-thin shells of porcelain that are bonded to your front teeth. With minimal-prep options, little enamel removal is necessary and usually local anesthetic is unnecessary. Reversing minimal prep veneers is also possible if you change your mind at a later time. Because they can look unnatural or bulky in certain cases, not all individuals make good candidates for minimal-prep veneers. If you would like to improve the look and function of your teeth, cosmetic dentistry is an ideal place to turn for help. This branch of dentistry provides a variety of procedures that can give you a brand new smile. Whether your teeth problems include discoloration, chips, cracks, or even missing teeth, visit a cosmetic dentist to see how your smile can be restored. The first thing you should do is find a cosmetic dentist with training and experience in correcting problems like yours. Ask for references, before and after pictures involving procedures you’re interested in, and proof of education to make sure the dentist is qualified. Once you’re confident you’ve found the right dentist, you should have a thorough examination so that the condition of your teeth and the goals for your smile can be discussed. Asking questions like expected outcomes, maintenance, and what the procedures entail will help you decide whether to pursue cosmetic dentistry treatment. What are some common procedures performed by a cosmetic dentist? The most popular is teeth whitening, which helps erase stains and brightens your teeth to a whiter color. Teeth become dull and stained with age, food consumption, and habits like smoking. A cosmetic dentist can use higher concentrations of bleach and faster methods than whitening products for use at home, so professional whitening can be a great solution. Another procedure that patients are usually very pleased with is the installation of dental veneers. These thin shells are placed over your teeth to hide the color, shape, chips, or gaps that might be making you unhappy with your smile. Veneers involve the dentist making a mold of your teeth, preparing your teeth for application, and then adhering them securely to the fronts of your teeth. Other procedures provided by cosmetic dentists include implants, bonding, fillings, and contouring. Some dentists even use lasers to perform procedures so that you receive the latest benefits that cosmetic dentistry has to offer to improve your smile.